Belize NMS: A moist northeasterly airflow is developing over the area and will support a few showers and periods of light rain. Seas will remain choppy today but winds and seas are expected to pick up later tonight into Friday. 24-hour forecast: Cloudy with sunny breaks today and cloudy to overcast tonight. A few showers and periods of light rain will affect mainly northern coastal areas today and then increase mainly along coastal areas tonight. Today: Winds: E-NE 5-15 kts. ; seas: Choppy. ; waves: 3-5 ft.; a few showers and periods of light rain (mainly in the north). Tomorrow: Winds: N-NE 10-20 kts with higher gusts. ; seas: Moderate-rough. ; waves: 4-7 ft.; some showers and periods of rain (especially south). Marine Outlook: Friday night:- winds: N-NE 10-20 kts. ; seas: Moderate; waves: 4-6 ft.; a few showers and periods of rain (mainly south). General Outlook: For Friday and Friday night is for cloudy to overcast skies with some showers and perods of rain mainly along coastal and southern areas. Gray sky and wind on Ambergris Caye this morning. The expected high is 78 and we have drizzle. A line of rain is developing across the north of Belize and moving Northwards, so there may be some rain in Corozal in the next few hours. 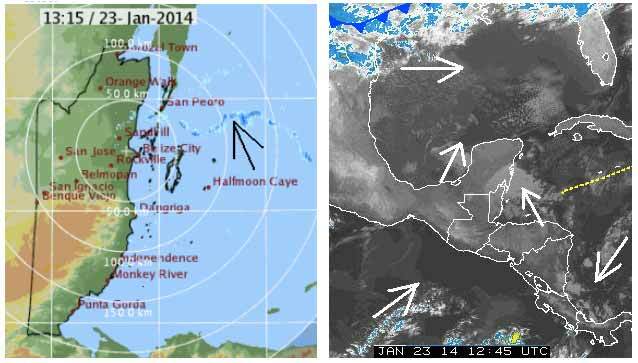 Looks like southerly warmer air moving in against the cooler air that was over Belize, hence the rain showers. There will probably be some periods of sun.